Perry's Zach Darr follows his shot during a triangular meet in Jefferson earlier this season. Photo courtesy Adam Kealhofer. 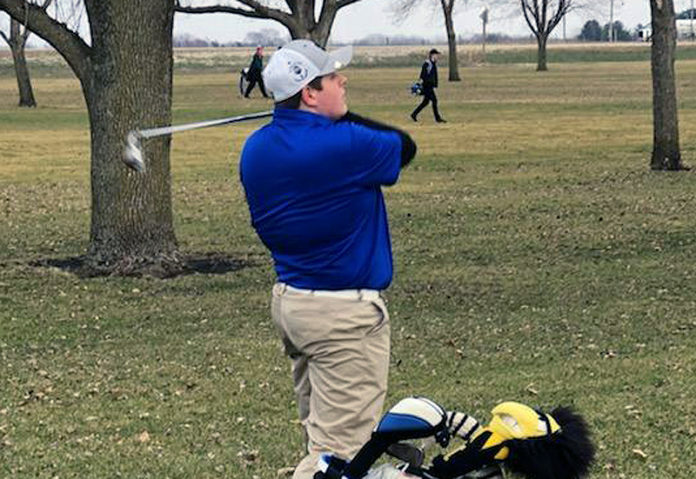 BOONE — The inexperienced Perry boys golf team is having to learn on the fly, and the first two days of the current week were part of the test, as the Bluejays followed 18 holes at the West Marshall Invitational Monday with nine holes in a quadrangular at Boone Tuesday. Perry had only three golfers in action Tuesday at Cedar Pointe Golf Course and thus could not generate a team score. Dalton Scott fired a 59 — a considerable improvement from his play Monday — with Zach Darr posting a 64 and Brady Herman a 95. Carroll won the meet with a score of 171, with Boone and Newton close by with cards of 176 and 177, respectively. The Boone junior varsity posted a 202 and the Carroll JV a 214. Boone’s Christian Bushore was the medalist with a round of 40, with a 41 from Carroll’s Jace Pettitt claiming runner-up medalist honors. The Bluejays traveled to State Center Monday for 18 holes at the hilly and challenging Lincoln Valley course, a venue with a reputation for unnerving first-time visitors, especially if a south wind blows. A total of 14 teams made the circuit, with Perry head coach Adam Kealhofer watching his squad enter the clubhouse with a combined 542. Darr had a 55-62–117 for Perry, with Isaac Noble shooting 58-60–118. Scott finished with a 70-68–138 while Herman turned in an 84-85–169. Nevada, Norwalk and Oskaloosa grabbed the top three team spots with scores of 314, 320 and 327, respectively. PCM was fourth at 331 and Grinnell fifth at 336, with West Marshall (352), South Hamilton (356), South Tama (363), Boone (366), East Marshall (387), Carlisle (391), Bondurant-Farrar (404), Colo-NESCO (520) and Perry (542) completing the field. Nevada’s Dylan Sporrer shot 36-37–73 for indivdual medalist honors, with PCM’s Reed Worth, Osklaloosa’s Austin Hafner and Norwalk’s Riley Jermier all carding rounds of 76 while Max Sutcliffe of Norwalk rounded out the low five with a 39-38–77. Perry hosts Winterset Thursday and will host the annual Bluejay Invitational Saturday.